Recently we went to the vast battlefield of Gettysburg, and it is one of my favorite places so far. This year Ollie and I are taking a class on the Civil War, so it had extra meaning for me. Before we went to Gettysburg, I hardly knew anything about it. I knew Abraham Lincoln had given a famous speech following the bloody battle, and I knew that it was a very large, serious battle, but I learned a ton while we were there. Upon arriving, we took a tour on Pickett’s charge, which is the Confederates last attack in the battle. The tour guide started out by explaining the layout of the battlefield, and then went on to explain the details. I was astounded at how much information there is about one battle! Of course, Gettysburg was the most decisive battle in the bloodiest war in American history. However, that tour we had was one and a half hours long, and it was just on one portion of the battle that was only 30 minutes long. It was really interesting to learn about, even though I had to ask my dad to explain what the tour guide meant a few times. Crazy Fact: Based on a study done in the late 1800’s, the death toll of the Civil War was 620,000. A recent study suggests as many as 850,000 people died in the war. Crazy right? To say it simply, Pickett’s charge was a Southern attempt to take the high ground which the Union occupied away and break the Union line. General Lee, the leader of the Southern army, figured that if he broke the center of the Northern line, it would split the troops in two sections and create confusion and chaos. Hopefully this map can sort of explain it better. Red is Confederate and blue is Union. 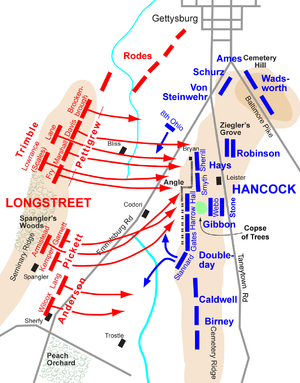 Longstreet is the Confederate General that was placed in charge of the attack, so that’s why it has Longstreet’s name there instead of General Lee’s. Look on the map where it says Copse of Trees. That was where Pickett was trying to get to, and that was the center of the Union line. Pickett’s charge was a failure, and ended in over 4,000 casualties. Right below the copse of trees is a depression in the ground. The Confederates reasoned that this was the best place for their troops to converge, or so they thought. The reason they thought it was a good idea was because if they did so, the Union cannons wouldn’t be able to shoot at them. The cannon balls would just go over them. The reason that the Union couldn’t aim their cannons down was because firing them downward would result in flipping the cannon, or possibly somersaulting. Anyways, when the Southerners converged near the copse of trees, they were surrounded, and all was lost. It was neat to be in the actual area where the battle of Gettysburg was won; there is a special feeling about the battlefield, it is hallowed ground. After the tour was over, we bought a battlefield auto tour. Auto tours are pretty nifty. It is a disc that you listen to in your car, while you drive to certain points on the battlefield. Once you get to the spot you look at what’s there and then get back in the car and drive to the next spot. It’s like taking a tour, except the tour guide is “in your car” and you don’t have to do as much walking! I loved the auto tour, and I think it helped us get a better perspective for what both sides were seeing. There were also lots of cool monuments to see. Gettysburg is actually the largest sculpture garden in the world, because of all the monuments and memorials. Amazing Fact: The Confederate line was 6 miles long and the Union line was 4 miles long! Just imagine a line of people that long! We got through about half of the auto tour by the time it got dark. We had originally planned to just stay a day at Gettysburg, but there was more that we wanted to do. We had unhitched the trailer in the visitor center parking lot so we could do the auto tour, so we re-hitched and stayed the night in a Walmart parking lot. That night we watched half of the movie Gettysburg. We only watched half because it is a 4 1/2 hour movie! I love that movie. It is one of my favorites. In the morning we continued the auto tour. We stopped by little round top, another major location in the battle. I’ll briefly explain what it is. Once again, the Union had the high ground. Confederates attempted to over take the hill in order to have better position to attack the back and side of the long Union line. 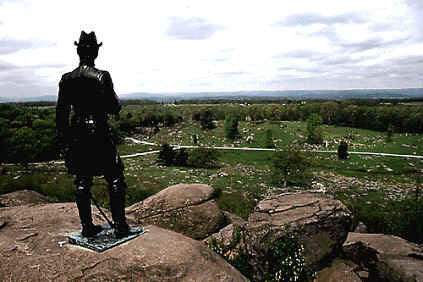 The surrounding area and slopes of little round top were covered in boulders and rough terrain. The base was known as devil’s den, for good reasons. The above picture is on the summit of little round top. You can see all of the boulders and rocks below. Imagine how hard that would be to climb and maneuver! There was a lot of fighting at little round top, but the most decisive part of this battle was the Union’s far left flank. The 20th Maine regiment, under command of Colonel Joshua Chamberlain, was placed on the Union left flank. He had orders to never let it fall because they were at the end of the entire Union line, not just little round top. With all the fighting going on on the front of the hill, some Confederate forces tried to slip behind and attack the Union troops from the back side (see map). The 20th Maine regiment was the defense against these troops. The regiment shot at wave after wave of Southern troops. The Southern troops would fire, retreat, and then come back and fire again. They came increasingly closer, and every time they came back out of the woods to fire at the Union soldiers, they were creeping their way farther around the back of the hill. When the Confederates were about to take over their position, Colonel Chamberlain called a bayonet charge. “BAYONETS!” he called, “FIX BAYONETS!! !” Chamberlain led the 20th Maine down the hill, forcing the rebels to retreat, capturing and killing along the way. 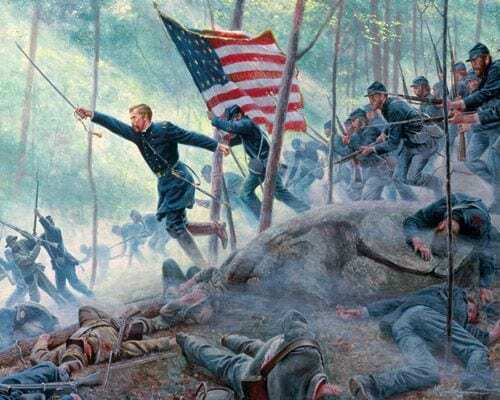 If it weren’t for the 20th Maine, little round top would probably have been over taken, and that would have changed the whole course of the battle. In the Gettysburg movie, Colonel Chamberlain is very soft-spoken; until he calls for the bayonet charge. When he does, his eyes go wide and his voice is way louder than it had been the entire movie. It’s pretty funny. Chamberlain also has an awesome mustache. After little round top, we went down to where a lot of the monuments are. We climbed the Pennsylvania monument, which had a great view. They had some people out with cannons and things that explained all the creative ways that cannons were used to hurt people. There was one type of shot called canister shot, which had two varieties. One was just a metal cylinder filled with gunpowder. When it was shot, the canister would explode and send thousands of pieces of metal shrapnel into enemy lines. The second variations was a metal cylinder filled with hundreds of little metal balls. So, when the canister exploded, it was like a giant shot gun, hitting many people with one shot. I thought it was cool to learn about all the different things they did with cannons. The ones I just mentioned are just a few out the variety of things they did. There was also a memorial for a regiment from Minnesota, my dad’s home state. It was cool because that was the regiment that closed a dangerous gap in the Union line, just in time. After we finished there, we went and saw the Memorial for General Meade, the Union commander for the battle of Gettysburg. We also saw his battlefield headquarters, a widow’s farm house. Next, we went to the national cemetery right near Gettysburg. It’s a beautiful, peaceful place, and the monument for the Gettysburg Address is beautiful as well. Later that night we watched the rest of Gettysburg. It’s a great show. Gettysburg is a special place. It was a place of great military strategy and bravery. It is the place where “a new birth of freedom” was on it’s way to becoming a reality. However, freedom isn’t free, and sometimes the price is heavy. There were 51,000 casualties in the battle of Gettysburg. I felt privileged to visit this historic site and be where those brave men and women stood and to see what they saw. Below are a couple poems that Ollie and I wrote about Gettysburg.